It is estimated that 80% of Australians will experience back pain at some time in their lives. During pregnancy, discomfort and soreness is quite common, with up to three quarters of women experiencing some kind of back pain during their pregnancy. The pain can be caused by a range of factors, including weight gain, posture changes as your centre of gravity shifts, hormone changes which allows your ligaments and joints to relax and loosen and muscle separation as the uterus expands. While most people only seek treatment once their back already has them in agony, there are some very simple and effective ways you can minimise or prevent back pain. These are things you can think about even before you conceive to ensure your body – and your spine – are in tip top shape before you get pregnant and for throughout your pregnancy. 1. Be careful how you lift: The age-old warnings about being careful while lifting still ring true. Nothing will injure a back faster than lifting too much weight too far in front of your body. Try to keep the weight as close to your centre of gravity as you can, rather than reaching out. 2. No twisting: Turning your body at the waist while lifting is also a huge no-no – especially when pregnant. Avoid forcible bending, twisting or pulling as much as you can while carrying heavy weights; which include children! 3. Look after yourself: It's a no-brainer, but maintaining your health, weight and lifestyle is probably the simplest healthy back tip to follow. Although weight gain is a normal part of pregnancy, excess weight and body fat puts unnecessary pressure on the back and increases the risk of injury. So it's important to keep looking after yourself by eating healthily and staying active when pregnant, for your own health as well as the health of your baby. Staying fit does help to minimise back pain during pregnancy and while the exercise shouldn't be strenuous, it can be a great way to stay healthy and support the back. Swimming – a popular form of exercise during pregnancy and can help prevent back pain after childbirth too. It's a good way to make sure the lower back muscles are exercised without strain, it keeps the leg muscles moving, improves circulation and overall health. Swimming is especially good in mid to late pregnancy when women are quite uncomfortable. Walking – brisk walking is safe and effective during pregnancy, without putting too much pressure on your back and joints. Walking can be incorporated as part of the daily routine, even just down to the shops or around the block - aim for 30 minutes per day. Prenatal yoga – yoga is easy on the joints, encourages relaxation and is great for helping with posture and maintaining muscle tone. Pilates – a great exercise to strengthen the pelvic floor muscles and to help alleviate back pain, by supporting and strengthening rather than straining the muscles. Pregnancy can be a strain on your body and it's normal to experience aches and pains throughout. But if your back pain becomes excessive or you notice any sudden changes – especially if you've experienced back problems pre-pregnancy – make sure you seek medical advice. In most cases, taking it easy and adding some light exercise to your routine, such as walking or swimming, will help relive pregnancy related back pain. Dr Parkinson is a highly qualified neurosurgeon with extensive experience in neurosurgery. He has studied under, and worked with leading neurosurgeons in the USA performing ground breaking surgeries. 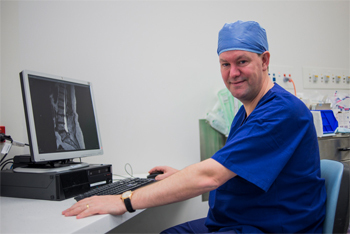 Dr Parkinson has attained internationally esteemed qualifications from both the USA and Australia and is a highly respected specialist at the forefront of Neurosurgical science and development. Dr Parkinson was the first to be trained in neurointervention in Australia and his expertise in the diagnosis and treatment of sports and neurological injuries is highly sought after by elite sportspeople throughout Australia.